Job seekers will park in the Paradise Pier Hotel general parking and receive a ticket upon entering the parking lot. Take the parking ticket to the Anaheim Resort Job Fair event taking place in the “Pacific Ballroom” and request validation at the registration desk. You will need a validated ticket in order to leave general parking lot. 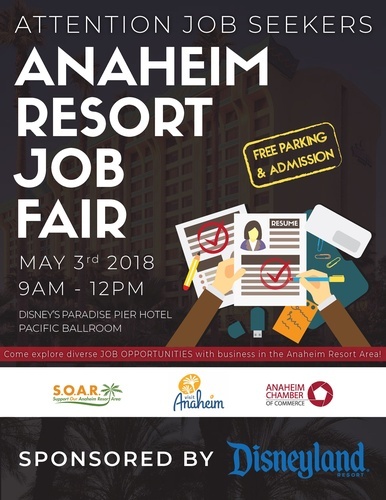 With exciting changes coming to Anaheim, the Anaheim Resort business community will host the 2018 Anaheim Resort Job Fair at Disney’s Paradise Pier Hotel on May 3rd. The job fair will include some of Anaheim’s biggest employers including hotels, restaurants and other tourism related businesses looking for job seekers to join their teams.